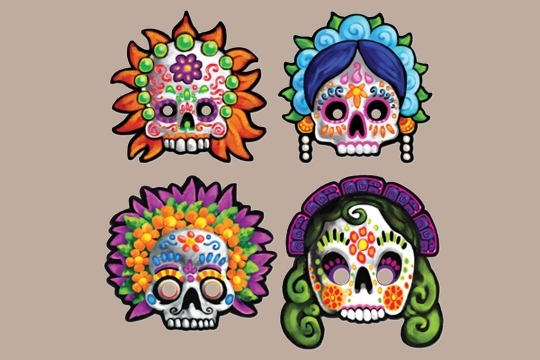 Made just like early paper masks, these tremendous sugar skull Muertos masks are so much fun. There is a set of 4 different masks (as shown) in each package, so you might even choose to share with a friend, or masquerade with your pets or your mannequins. There are holes for your eyes and the nose area pops out enough to breathe easily - but, there is a small flap which carries on the image. Each mask has white elastic already attached so that it can easily be worn. The masks are all different but measure about 12 inches each way on the average. The elastic should fit most heads. Because these are so cheerful, you might choose to frame one set as wall décor!